The Senate Committee on Small Business and Entrepreneurship held a hearing on Wednesday to identify persistent challenges and opportunities for women entrepreneurs. Twenty-six years ago, the Women's Business Ownership Act was passed, which, according to the report, "helped women's business-ownership grow from 4.1 million small businesses in 1987 to 8.6 million in 2013. In 2009, women-owned businesses had an economic impact of nearly $3 trillion -- translating into the creation/maintenance of 23 million jobs and 16 percent of all U.S. jobs." The hearing highlightd the report "21st Century Barriers to Women's Entrepreneurship," which finds women are still facing challenges accessing capital,federal contracting and business counseling. The report finds that women entrepreneurs, while owning 30 percent of small companies, still only receive a small portion of business loans -- 4.4 percent. They are still facing challenges getting equal access to federal government contracts -- the government never meets its goal of 5 percent for women-owned businesses -- an opportunity worth at least $4 billion, and funding has remained flat for Women Business Centers in all 50 states since the 1990s. The centers have not been re-authorized. In terms of numbers of loans, businesses owned by women receive only 16 percent of all conventional small-business loans, and 17 percent of loans backed by the Small Business Administration. Their loan applications are more likely to be rejected than those from businesses owned by men, and the loans they get are likely to have more stringent terms. Women also receive only 7 percent of venture-capital funding. "The numbers are jarring, for sure, and we need to own up to the fact that we want to see more women entrepreneurs, and to make sure they're getting access to capital," Committee Chair Maria Cantwell, D-Wash., told The Associated Press. Witnesses at the hearing included SBA Administrator Maria Contreras-Sweet; Barbara Corcoran, the founder of the New York real estate company The Corcoran Group; and Nely Galan, media and real estate entrepreneur and founder of The Adelante Movement, who founded her own media company in 1994 and was the first Latina president of a U.S. television network. "You can imagine my surprise when suddenly one day the station that I ran, but did not own, was sold. It was then that my employer said ten words that forever changed my life: 'You need to get your own chips, these are mine.'" Galan told the Committee. "Out of anger, I started a new business so that I could 'own my own chip.' But nothing could have prepared me for how hard it would truly be. I figured everything out on my own because I was not aware of, nor did I have access to, the tools or resources that were available to women business owners. My success has been the product of nothing more than hard work, a lot of luck, and a series of good mentors. In a way I created my own personal women's small business center." 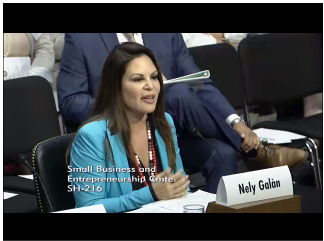 Galan added, "Latina mothers are the fastest growing entrepreneurs, control most of their households' budgets, and are the key decision makers with regards to their children's education. They are pillars of our community and will only grow in influence as more and more come of age each year. Latina women are expected to become 30 percent of the total female population in this country by 2060." The report has recommendations for improving opportunities for women entrepreneurs -- expanding microloans and making the SBA's Intermediary loan program permanent to provide more capital to women entrepreneurs, changing federal law giving women-owned businesses the opportunity to win sole source federal contracts, and reauthorizing the Women Business Centers and funding them to provide training and counseling to women, especially low-income women.